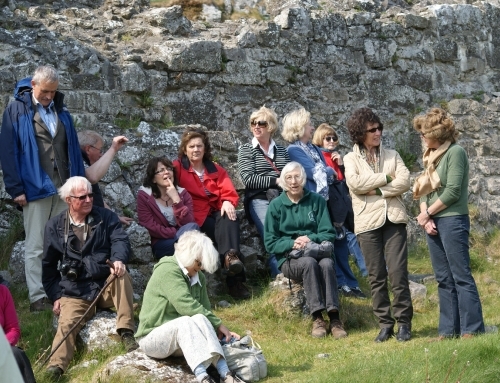 About thirty-five members met outside Holy Trinity Church on Saturday 30th April for a walk around the Rock of Dunamase (Dún Másc, which translates as “the fort of Masc”). Despite a brisk wind, the afternoon was sunny and warm with a temperature of about 16°. It was decided to hold the outing on a Saturday because the Rock is a popular Sunday venue and parking is difficult. However, this consideration did not help much as our arrival coincided with that of a funeral gathering at Holy Trinity Church, and a wedding party came along to take photographs on the Rock just as we were leaving. 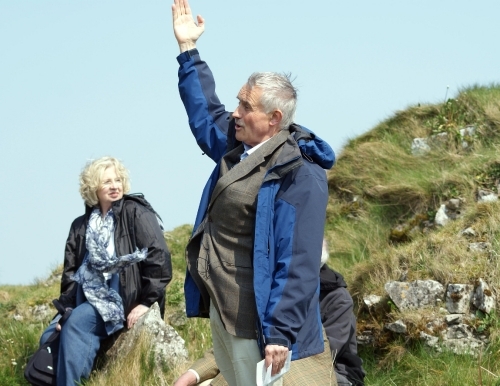 The outing was led by Conleth Manning, who explained that the site of The Rock of Dunamase had been adopted as a National Monument under State care in recent years. Excavations under the direction of Brian Hodkinson had taken place between 1993 – 1995, and conservation work on the walls was completed in 1996. 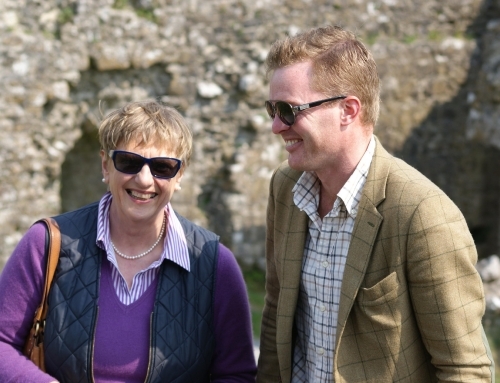 Following this, the site was officially opened by Tom Parlon who was TD for the Laois-Offaly constituency from 2002 – 2007 and was Minister of State at the Department of Finance with special responsibility for the Office of Public Works. Information plaques had been placed around the site but these had been destroyed subsequently; the area is very open and difficult to protect from such vandalism. The amazing views across the surrounding countryside from this elevated site confirm that this was once one of the most strongly defended sites in Ireland, and no further explanation is required as to why an early-medieval royal castle was built here. It is set on a limestone outcrop with cliffs, and the castle was constructed in limestone, with ornamental stones carved out of sandstone. Apart from obvious features such as the barbicans, ditches, banks and some walls, much of the site’s history is still an unresolved puzzle. Con pointed out that Grose’s Antiquities contains three illustrations relating to the site and mentions Sir John Parnell converting part of the Hall Keep into a banqueting hall towards the end of the Eighteenth Century. A lime kiln is located inside the main gatehouse, and this may have been to provide mortar for Parnell’s work. Brian Hodkinson’s e xcavation led him to draw several conclusions about Parnell’s work. However, the most significant part of this excavation was the discovery of the original Norman gatehouse. Two other rather touching finds at this time were a kitten’s paw mark which was discovered in the mortar in a lower part of the wall of the Hall, and the conservators found an impression of a medieval leather shoe in the mortar on the parapet. The reason for the destruction of the site has not been established. 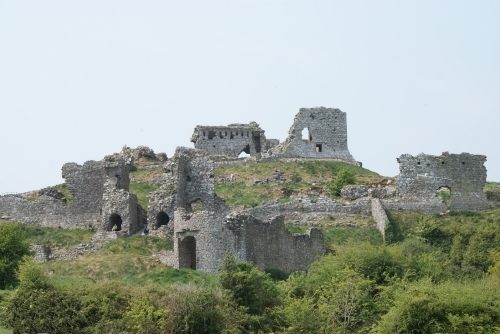 On leaving the Rock of Dunamase, we travelled to Killenard, where Michael Dempsey had arranged delightful refreshments of tea, coffee, and a selection of muffins and scones at Hanley’s. Altogether, it was an interesting and enjoyable afternoon.